Keeping bees requires as little as 32 hours per year for the backyard beekeeper managing one or two hives in there back yard. It can be a very rewarding and educational experiance. Anyone can keep bees I have met beekeepers as young as 10 years old. You can get started keeping bees with an investment between $200 and $500. This depends wether you build your own hives or puchase your hives ready to go or buying a bee package or plan on capturing a swarm. Starting a beehive with a bee package subjects includes, hive preparation, installing the bee package, equipment needed, feeding your new bees and hive inspection and maintaince. Swarm capture class includes, methods for capturing swarms, ladder safety, questions to ask a person reporting a swarm, having your equipment ready, tools that can be useful for swarm capture, swarms in difficult locations when to walk away for your safety. A beehive, hive tool, bee brush, smoker, bee Jacket, and of course bees. Below is a photo of the basic equipment listed. Bee hives are started in the spring around the end of April in the Denver metro area. If planning on starting a beehive planning ahead is a good idea. Joining a bee club and attending meetings will help you get comfortable with bees. Taking a bee class to learn the basics will be helpful as well. Youtube is another great resource for learning about bees there are hundreds of videos on every aspect of beekeeping. From installing a new bee package to collecting a swarm of bees. If you plan on ordering bees it is a good idea to order early February or March for spring delivery. Start by talking with your local club about purchasing a bee package or nuc box. A bee package is a screened box with 3 to 5 pounds of bees and a queen in a cage. A nuc box will have 4 to 5 frames with a loose queen, honey bees, frames with honey, pollen and brood. Nucs can be purchased from local beekeepers who are splitting there hives and can be a great head start for your new hive. In the spring with new bees it is important to feed your bees by providing them with sugar water and pollen patties. The pollen is important in the spring as they need the protien for rearing thier brood. This gives the bees a head start before the main foraging season starts. Once you start feeding them you will need to keep feeding them until there is adequate forage to sustain the hive with plenty of pollen and nectar. To make your own pollen patty's add 3 cups Soy Flour, 1 cup Brewer’s Yeast, 1 cup dry skimmed milk, and mix the dry ingredients completely. To make one pollen patty mix ½ cup of dry patty mix with a 50/50 sugar water mix add sugar water as needed to get a peanut butter texture. Then form a patty about ¼” thick and wrap with wax papers. The wax paper keeps the patty moist. Place the patty over the top of the bees frames in the center of the hive. The bees will chew through the wax paper to get to the pollen patty. As your colony of bees grow you need to add additional space for them to grow if you are using a 10 frame Langstroth hive let the bees fill at least 8 of the frames before adding a second box. This will be determined by inspecting your hive and looking for stored honey, stored pollen and brood. 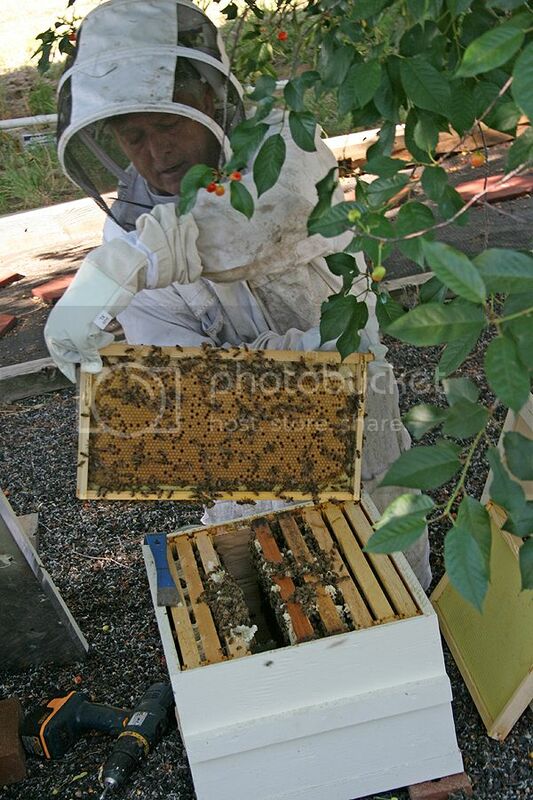 Below are photos of a frames with honey stores, pollen and brood. Note the brown area in the frame this capped brood the white color in the corners is honey. Brood frames tend to be in the center of the hive body both of these frames show a good laying pattern and would indicate a heathly queen is in the hive. The link below has more photo's of hive inspections of six hives at one of my hive hosts in Arvada. 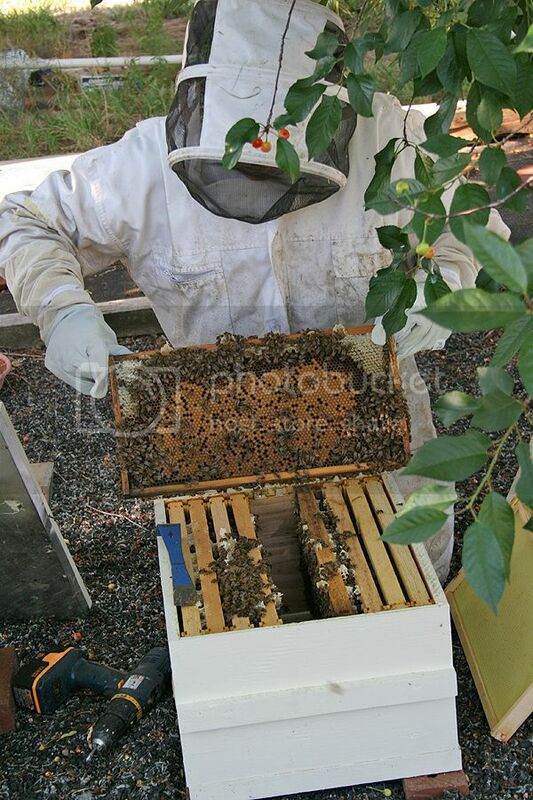 Includes photo's of me removing chicken wire from bee frames from bees that were removed from homes. Photo's taken by Cheryl Netter hive host Arvada. There are many types of bee hives that can be used this link describes most of them. However the Langstroth hive and the top bar are the most popular. The link below has photos of what hives look like that have parasites and decease. Why do honey b tik? bees get sick? The linka below describes the different types of honey bees introduced to the US and there characteristics. http://www.masterbeekeeper.org/b_files.htm This website link from the Department of Entomology, Cornell University describes and discusses be diseases and pest management methods a very comprehensive and useful information for beekeepers. The links below are deceases and mites that can destroy bee hive colonies. Managing Varro mites with drone comb PDF file from Cornell University. I had the pleasure of attending a Denver Bee Club meeting with Dr. Geraldine Wright as a speaker about bee nutrition and bee behaviour and nutrition very cool. Here are links to their websites. Content copyright . DAKOTABEES.COM. All rights reserved.